I went completely Vegan for the month of February, (and loved it by the way), but the number one question people were asking me throughout was 'Isn't it really hard to be Vegan?' Short answer: Not really! It just takes a well stocked fridge and a bit of preparation. 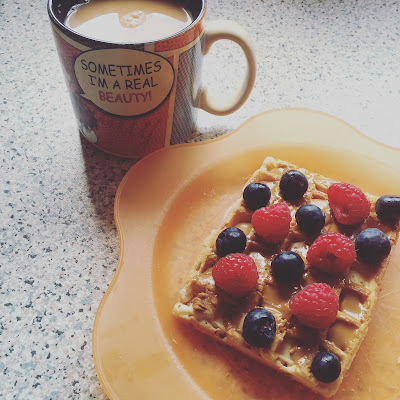 I decided it would be fun to do a little series on my blog called Easy Vegan, with simple meal ideas and recipes for people that needed some food inspo. First up is Breakfast. Don't judge me and I wont judge you. Day 1: Coconut Yoghurt, mixed berries and granola. You can now find non-dairy yoghurt in their refrigerated section of pretty much every supermarket chain. Yay! My local co-op only stocks the Alpro brand, which is still a great alternative and comes in Plain, Vanilla or Coconut flavour. The best Vegan yoghurt in my opinion is by CoYo as it's a really thick and creamy consistency, and entirely made from coconut milk. It tastes more like dessert than breakfast if you ask me, but I'm not complaining! (Oh and you can find it in Waitrose or Tesco.) I just throw whatever fruit we have in a little bowl, with a bit of Vegan granola, or pecans, and a sprinkling of chia seeds. 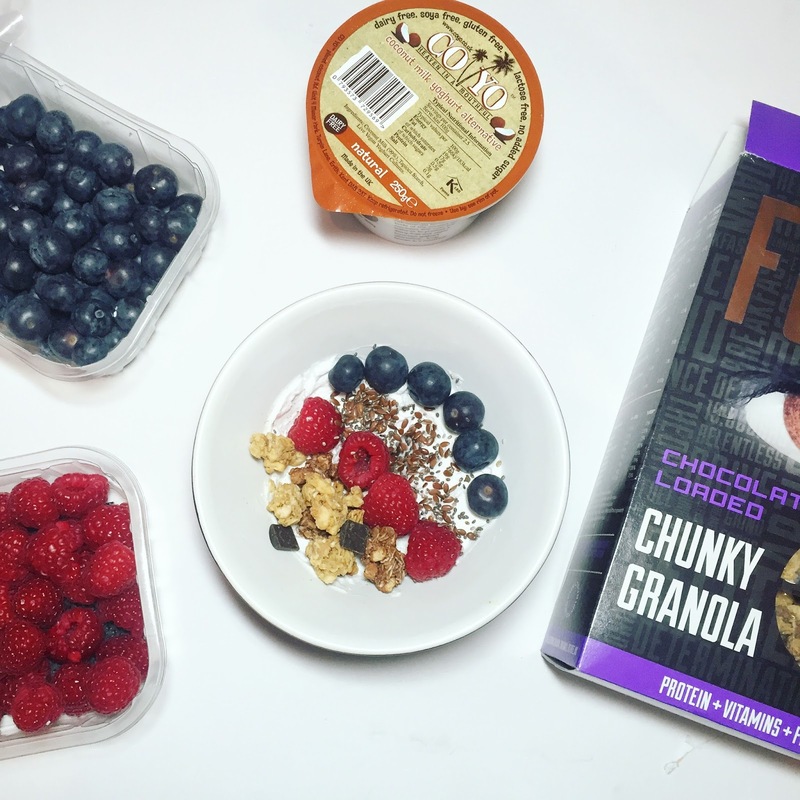 That's after I've taken a cute Insta pic of course... Also this is the Fuel 10K Chunky Granola, it's high protein, has dark chocolate chips in it and I bloody love it. If you've found any yummy Vegan granola, let me know, as I'm always looking for new ones to try! Ok so Avocado on toast is life. I probably go through four avocados a week because they're so damn delicious! This is my favourite breakfast/brunch option for the days when I have a long shift at work ahead of me, as this keeps me full for ages. I always opt for wholemeal or sourdough bread, and a whole avocado. Cause let's be honest, who really saves some for another day? I usually top mine with some kind of onion or I'll have radishes, if my taste buds are feeling a bit delicate. Then it's rock salt and all the chilli and black pepper in the world! Some people over-share; I over-season. So depending how much I have planned that day, I may eat the rice cakes as a mid morning snack and just the smoothie for breakfast, but for the sake of the matter, here it all is looking adorable with a capital A. The smoothie was just a mixture of frozen summer berries, half a banana and spinach. 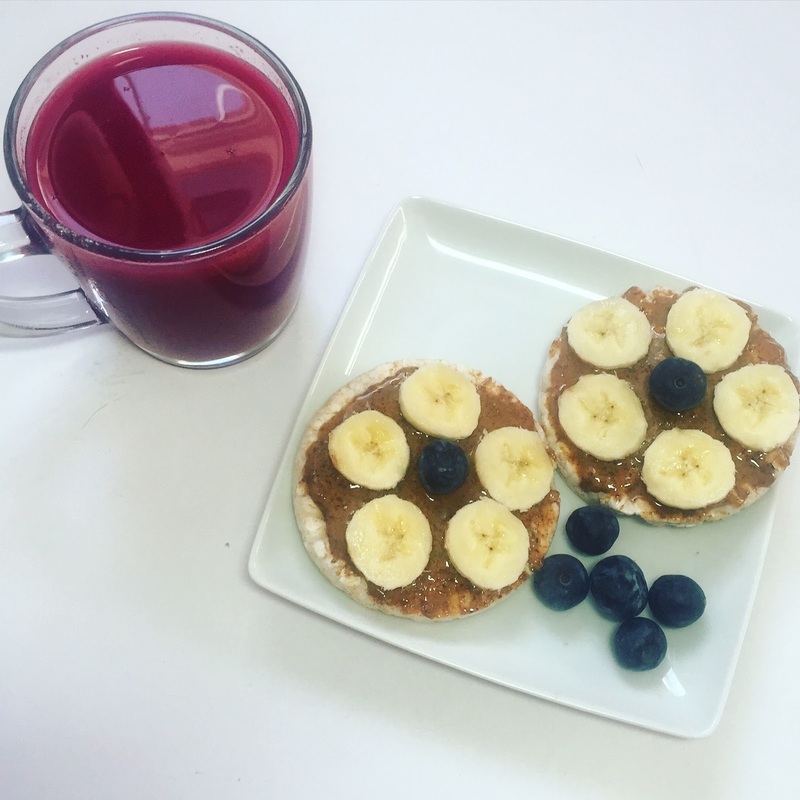 It's SO sweet and tangy, and the perfect wake me up! Rice cakes are a great option on days I don't fancy loads of carbs in the morning, these are the Kallo Organic ones, and are only 15 calories a piece! (Don't eat them on their own though, they taste like cardboard.) I've topped mine with the Meridian Organic Almond Butter, and then the remaining half banana from the smoothie and a blueberry. LOL at the single blueberry. Sometimes I'll sprinkle cinnamon on top, but I forgot on this particular day. I have this brand for Peanut and Almond butter and I do love it, but it does get quite annoying at how quickly it separates between uses, so you'll need to give it a good ol' stir! Probably the most boring breakfast option but in the winter it's something I can't live without. And with England being eternally in Winter, I have it an awful lot. My favourite are the Jordans Organic Chunky Porridge Oats as they have a lovely texture, unlike some brands which I find go all gloopy and horrible when heated. I add whatever milk substitute I have on hand, (soya, almond, coconut or oat milk) and put it in the microwave for 2 mins! When I'm feeling extra sorry for myself I do add a spoonful of Cookie Butter on top which melts into the porridge and is beyond heavenly. I discovered Cookie Butter in Trader Joes in the US after I saw loads of American bloggers singing its praises, and found basically the exact same product in Tesco of all places, called Lotus Biscoff Spread. If you haven't tried it, you MUST. It's essentially a spread made from crushed up biscuits. Need I say more? So Cookie Butter. That thing I mentioned in the paragraph above? It's back with a vengeance. As always I'd love to hear if you've had any tasty Vegan meals recently, and if you have a recipe or something you'd like me to cover in this series, then leave a comment below! 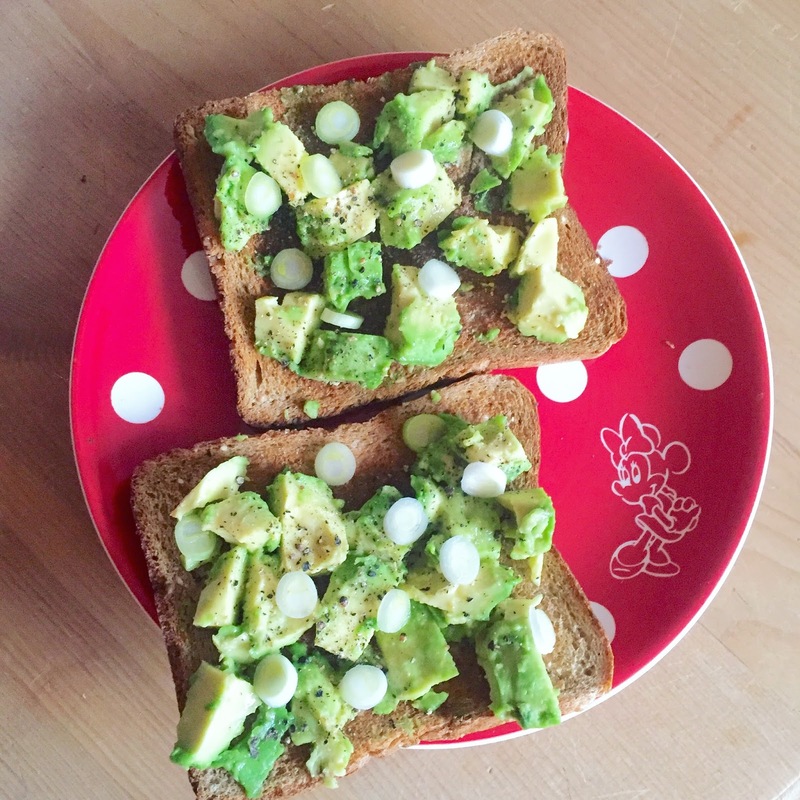 I honestly can not get enough of avocado on toast! It's the dream isn't it? Glad I'm not the only one haha!